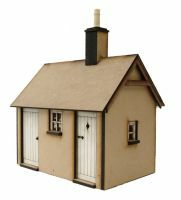 Due to the unerring popularity of our Flower Pot Cottage design, we are excited to finally be able to offer this traditional cottage in 1:144th scale too! Our ‘Micro’ sized ‘Flower Pot Cottage’ kit has been designed by Bea (Fiona) Broadwood and in this exciting new ‘Intermediate’ MICRO kit range all of the quaint country elements of the dolls house have already been precision cut for you - All you need to do is add paint and glue! So if you are you a 'micro' fan, or if you are a 1:12th miniaturist looking for a truly unique PETITE PROPERTIES 'inspired' dolls house for your own dolls house, then our news kit series is just for you! Our adorable ‘Micro’ Flower Pot Cottage has three internal rooms and a front garden area with a fully removable front and front roof for easy access. Many more 1:144th will be released in this series…! Please note that the image shown shows a constructed and painted kit. The kit supplied will require construction and comes unpainted. The shipping cost of this product will be calculated during the checkout stage after you, the customer, has inputted your delivery address.